Claimed Features – “Designed to give the highest luster with the least amount of effort. Will melt away rust, tarnish and oxidation, leaving a high gloss protection. Apparently Wizards Metal Polish cotton wadding is designed to be used when the corrosion is severe enough to require some physical action to remove it and polish the metal. We assume the ingredients in that product offer a more dramatic cleaning and polishing action. 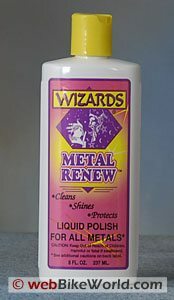 Wizards Metal Renew seems to work well on pre-cleaned chrome or metal bits on a motorcycle or metal parts that have previously been cleaned with Wizards Metal Polish. 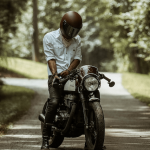 We’re not sure if Metal Renew is more effective than some of the other metal polishes we’ve tried (see the wBW Motorcycle Cleaner, Polish and Wax Reviews home page), but it works as advertised and seems to produce a better-than-average shine with less-than-average effort. This is another product that, when used as directed with an additional top coating of Wizards Supreme Seal, provides a smooth and glossy surface.